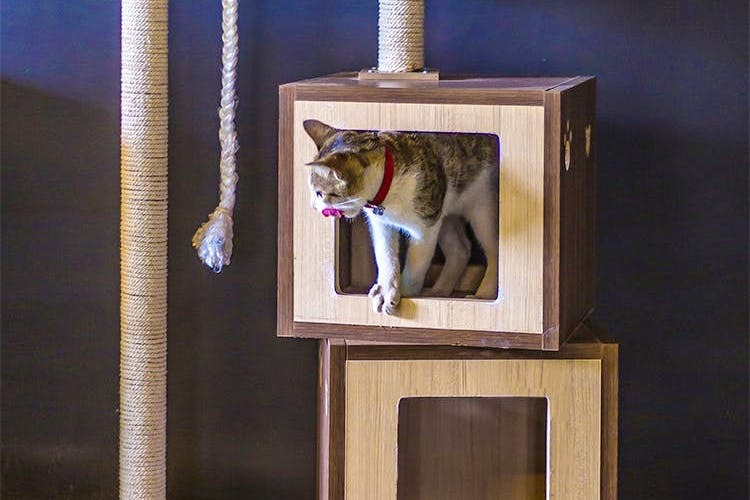 Shalakaa Diwanjii from Pune, who is also an animal communicator, makes awesome cat furniture which are handmade and meticulously crafted using safe natural materials. Based on the feedback from her 9 cats, she makes a special collection ranging from cat gyms, trees, perches and beds. Her venture is called Pawsh Cats and it’s as adorable as it sounds. Constructed from plywood, mdr, laminate and rope, these cat trees are easy to clean and durable. Not only you can put in fabric and remove it to wash as you prefer, you can also dismantle them while packing and easily assemble when required. If you are wondering why does your cat need a cat tree, you should know that they serve both an emotional and a practical purpose. Your cat will have a place to scratch without damaging the furniture, it provides exercise as they climb around and the boxes give them a quiet space to nap. Apart from that, your cat will love being able to sit at a height from where it can observe whatever is going on. It will get an increased sense of security as it’ll a place which is completely its own. The price starts from INR 2,400 and increases depending on the size and the intricacy of the work. The furniture is made in Pune and can be shipped across all across India and abroad. Do give it a shot. As you know, happy cats make for happy owners.